ASH AND QUILL starts off with a bang of action, right where things left off in the last installment. Jess and crew are prisoners of the burners and it's not an easy place to be. The concept of book burning is so horrific and the danger they are in as being part of the library even though they are trying to rebel... is intense. I was on the edge of my seat, reading the pages as fast as I could to see what happened next. That being said, after the initial bang of the opening things did seem to slow down a bit. Don't get me wrong, their situation never lightens, and the challenges are astounding. And yet...it just felt like a middle book or sophomoric slump at times. Perhaps it's due to a lack of a feeling of forward momentum in the war against the library until the very end. As I said, there's an incredible amount of danger and intensity at all times, but the lack of the forward momentum in the overall series plot weighed things down a bit. Hopefully after the insane ending of this book, things will take back off with a fury in the next installment. Surprisingly despite all that is going around them, and all the intense danger/action moments there's also plenty of character development, which I really enjoyed. For such a large cast of characters, each and every one is completely and fully three dimensional. You really care for each and every one of them. 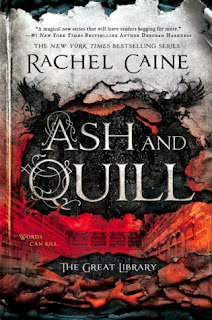 All in all ASH AND QUILL was an enjoyable installment in The Great Library series, and after that ending, I'm desperate to get my hands on the next one!